In 1985 Ivan Mauger and his Edinburgh-born mechanic Norrie Allan decided to include Edinburgh in the farewell series Ivan was planning to mark the conclusion of his incredible career. This meant that Powderhall was to witness probably the finest lineup of riders it ever did, even though stringent BSPA rules prevented even more World stars from appearing (the event was forced to include riders from only 4 clubs). A crowd of over 3,000 ignored the rain to enjoy a memorable evening - Erik Gundersen the star, John Cook and Phil Collins the thrillmakers, and Peter Collins the winner. 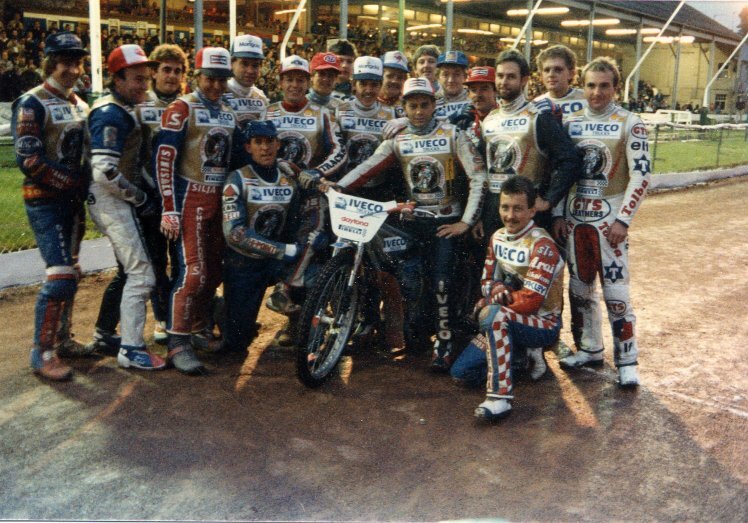 The riders pictured are (from left): Jeremy Doncaster, Peter Collins, Richard Knight, Kai Niemi, Finn Jensen, John Cook (kneeling), Chris Morton, Simon Cross, Barrie Dixon, Erik Gundersen, Brett Saunders, Ivan Mauger, Steve Finch, Billy Burton, Bobby Beaton, Eddie Ingels, Shawn Moran (kneeling), Scott Lamb, Phil Collins.